There is nothing like the feel of fresh, green grass between bare toes, but the sensory feeling is transformed to one of puzzlement when the lawn is spongy. Spongy sod is a result of excess thatch in lawns. Getting rid of lawn thatch takes several steps and a resolute gardener. 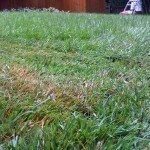 Learn how to deal with lawn thatch so you don’t have to replace your landscape grass to remove the spongy lawn. You must know your enemy to win the battle, so what is lawn thatch? Spongy lawns are the result of excess buildup of old and dead grass material. Some types of grass don’t produce thatch but others with thick stolens will trap their own leaves and stems. Overly thick thatch not only makes the lawn spongy but it can interfere with the plant’s ability to gather air, water and fertilizer. The roots are forced to grow on top of the thatch and the sponginess increases. Getting rid of lawn thatch increases the health and texture of the grass. Thatch in lawns is most common in acidic and compact soil. 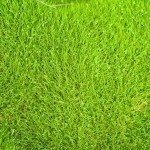 The spongy lawn is a result of many factors such as excess nitrogen, disease and pest problems, as well as improper mowing. Correct cultural practices will help reduce the amount of thatch that forms. You can also choose a grass variety that is less prone to thatch formation. Grasses that grow slowly, such as tall fescue, zoysia grass and perennial ryegrass, produce relatively little thatch. Dethatch your lawn mechanically in late summer or early fall when your lawn has slowed down its growth for the season. A good old-fashioned rake is one of the best ways to reduce the thatch in the grass. A little thatch is not harmful but anything over one inch is damaging to the sod. Really thick thatch requires a dethatching rake, which is larger and has sharp tines. These cut and grab the thatch to pull it out of the layer of sod. Rake the lawn thoroughly after dethatching. In about one week, apply one pound of nitrogen fertilizer per 1,000 square feet of lawn and water in completely. Rake the lawn annually at the end of the season for cool season grasses but in spring for warm season grasses. For larger areas, it is a good idea to rent a powered dethatcher. You should do some research before you use a machine as incorrect use can injure the lawn. You can also rent a vertical mower, which operates much like a gas-powered lawn mower. If thatch is excessively thick, the lawn will be damaged by dethatching. In such cases, you will need to top dress the area and reseed.